Choosing the right air conditioner repair company will give you comfort and peace of mind. We know it’s never convenient to have your AC breakdown. By choosing Fox Family Heating, Air Conditioning and Solar you are guaranteed fast, honest and friendly service. We’ll get out to your home to diagnose the problem as soon as we possibly can. We are careful and protective of your home by putting on shoe covers and cleaning up after ourselves. Our technicians will always greet you with a smile and clearly communicate what the problem is to you. Before we begin the repair you will be presented with an honest, fair estimate to perform the work. Trane, Ruud, Rheem, American Standart, Coleman, Amana, York, Carrier, Bryant, Lennox, and Goodman. This is a question that has a multitude of answers but in order to troubleshoot the problem, we encourage you to double check a few basics first. Check the batteries in your thermostat. If the AC is not turning on at the thermostat you may have a bad compressor. Why is my air conditioner not cooling my home? Is your AC blowing warm air? If so, you could likely have an impacted air filter or disconnected or damaged duct work. We recommend taking a look at the registers and checking your air filters. Why does my central air conditioner keep freezing up? This can happen when you have a clogged filter or a dirty evaporator coil. 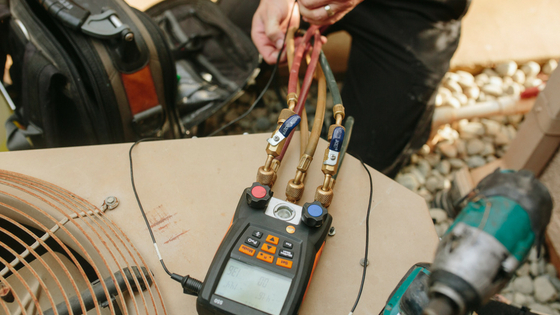 Another reason could be that your HVAC system is having refrigerant line issues. How much will it cost to fix my air conditioner? That depends on the type of repair. A broken AC can cost anywhere from $100 – $2,000. If the part is easy to replace and inexpensive then it will be on the low end. Other times replacing a motor that may be a special order part can be on the higher end. What’s the Best Way to Cool My Two-Story House? What Temperature Should I Set the Thermostat in My House?